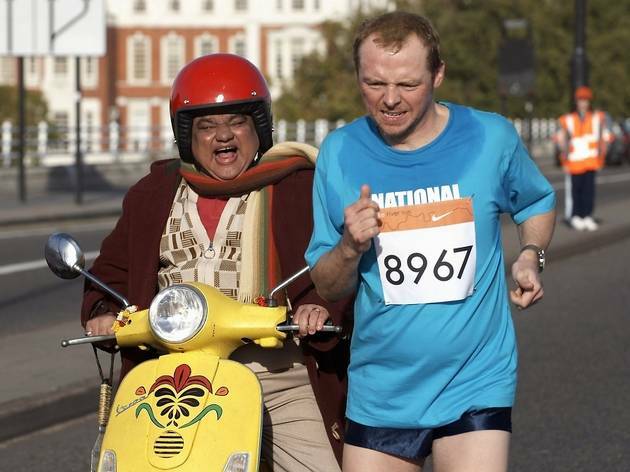 Simon Pegg’s ever-personable blokeyness holds this middling comedy together from start to finish-line. Five years on from a wedding-day panic that saw him leaving pregnant Thandie Newton at the altar, he’s now working as a lowly security guard. The arrival of slick financier Hank Azaria in her life gives him cause to shape up and win her back, though accepting his rival’s challenge of running head-to-head in London’s latest marathon seems an unlikely route to redemption, given that the superfit Yank lines up as odds-on favourite against this pot-bellied Brit. Sounds predictable? Trust me, it is, what with Pegg’s supporting team (slacker Dylan Moran and roly-poly Asian landlord Harish Patel) filling in the gaps, and bonding opportunities with his son intended as emotional undertow. What should be dreadfully synthetic actually plays as a pleasant time-passer, thanks to a goodly supply of one-liners, and Pegg and Newton’s facility for investing a string of hokey plot devices with genuine warmth. Formulaic, yet disarmingly enjoyable.